In honor of moms everywhere, and the upcoming Mothers Day holiday, I’m hosting some giveaways this week with a Mothers Day brunch theme! To kick us off is Le Creuset with a gorgeous cake stand (I love cake stands) that is perfect for a cake, pie, cookies, lets be honest, I’d serve roast chicken off this thing, it’s gorgeous! But not just that, we are also throwing in some beautiful French preserves by Bonne Maman. The winner also gets four jars in fabulous flavors like Fig, Strawberry and Golden Mirabelle. I love that these are jams that have simple, honest ingredients, jam like your Grandmother would have made in her own kitchen, with the fruit from her trees. To celebrate these gorgeous jams, I wanted to give you a recipe that works well with all the great flavors. Of course, I looked to Martha, a woman who is no stranger to French jams. I adapted her amazing crumb cake recipe for the use of these jams, making it three times to get it just right. I love this so much, and I love that it works with all of these fabulous jams. 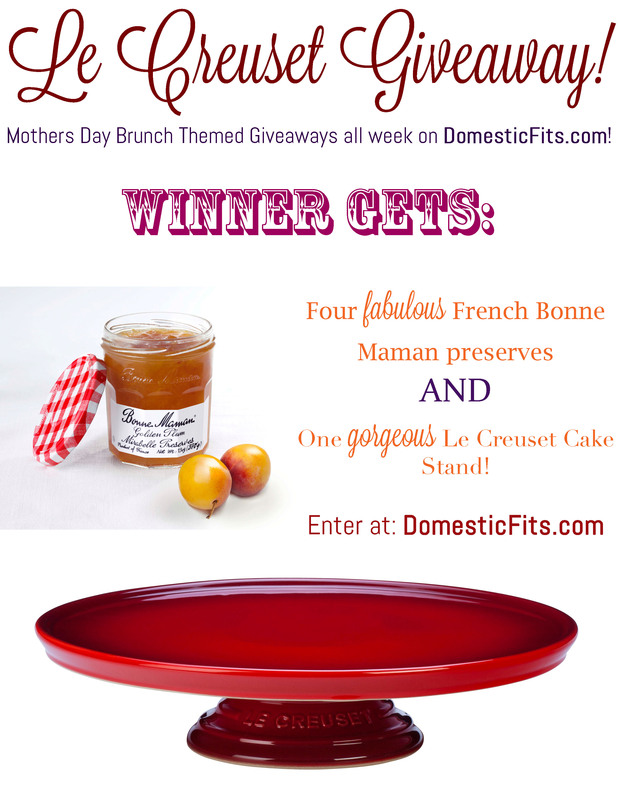 The winner will receive: One cherry red Le Creuset cake stand, four jars of French Bonne Maman preserves, shipped anywhere in the continental USA, you can even have it shipped directly to your mom! Or keep it for yourself, I won’t judge. Congrats to Whitney! Our winner! line 8X8 pan with aluminum foil, spray with butter cooking spray, set aside. Stir together 1 ¼ cups flour, granulated sugar, baking powder and salt in a large bowl. In a separate bowl, whisk together the egg, milk, vanilla and vegetable oil. Stir the wet ingredients into the dry ingredients, batter will be thick. Spread the batter in an even layer in the prepared f baking pan. In a small bowl, whisk together the cream cheese, egg and granulated sugar. Spread evenly on top of the batter. Drizzle with the jam (marble in with a knife, if desired). Combine the remaining 1 ¾ cup flour, brown sugar, and cinnamon in a bowl. Drizzle with melted butter, stir together until crumbs form. Bake at 325 for 32-36 minutes or until the top crumbs have just started to turn golden brown. Allow to cool to room temperature, chill until ready to use. Cut into squares and dust with confectioners sugar prior to serving. This is gorgeous!! Tons of crumb, I love that! I recently made a crumb cake for another project I’m working on and didn’t even know that Martha recipe was around. Wow, looks like a keeper. And what a fabulous giveaway. Just started a lecreuset one on my site today too! Pinned! And it was AWESOME to meet you this weekend! Hello. I’m new to your site (just came across it in the previous post on the strawberry cheesecake popcycles). And I just love your photos! I love how you capture the “fun in the sun” theme in your photos. Like the strawberry cheesecake popcycle, this photo relays the bright sunshine of a warm spring day….when everything is sunny, relaxed, and carefree. love this giveaway – & that cake looks pretty good too! holy crap I want that cake stand. gorgeous! Cake stands rock! And it comes in pink! You can bet I will be saving this recipe. I love crumb cake …. always have, always will. We used to buy it from a local bakery when we were down the shore and when we weren’t there, Mom made it too. This recipe looks and sounds absolutely delicious! Thanks for posting. This cake stand is beautiful. great giveaway. That cake stand is gorgeous and the cake looks delicious! Look at that crumb! Sky high! LOVE it! And the cake stand from Le Creuset – swoon!!! Pinning! My Mom would love this crumb cake, especially served on this cake stand! Beautiful! The crumb cakes looks delicious. I would need to have company over to enjoy it with me, or I might just finish it myself! What a beautiful cake stand! Your crumb cake looks delicious I’ll be adding it to my next brunch menu. This is great! I just got a full set of Le Creuset dinnerware for my wedding, it would be fun to have a matching cake stand! Everything about this post is perfect. Crumb cake is like my kryptonite. The cake looks absolutely delicious! I wish I had a piece right NOW! what a lovely recipe! Yay for Mothers! What a delicious recipe!! I have a few le crueset pans and i had no idea they make cake plates this is so gorgeous! Oh hey crumbly, carby, delicious thangggg!! Love the cherry red cake stand! I must try this crumb cake recipe too – my husband is a big fan of the breakfast treat. Love Le Creuset and the Bon Maman preserves. That cake looks delicious…..and that cake plate is beautiful. Bon Maman preserves are the best! This cake looks so good! I wish someone would show up at my door with one! Pick me pick me! And thanks for the recipe! Your crumb to cake ratio is spot on! I would eat a whole pan of crumb topping if i could. Beautiful cake! Crumb cakes are my favorite. 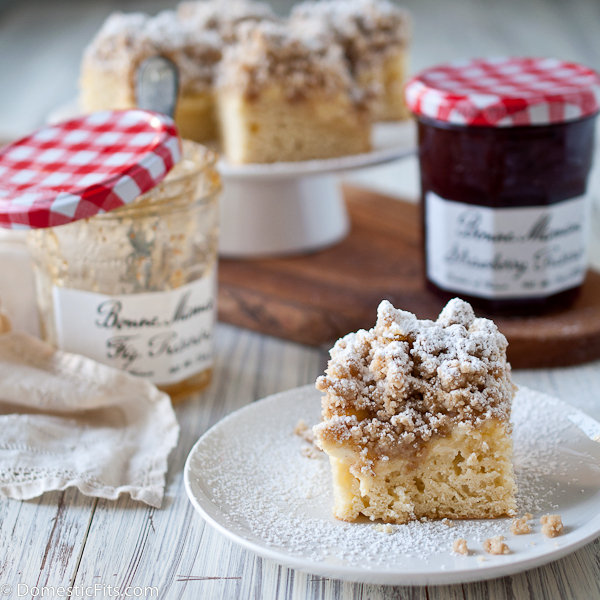 Love le creuset…love Bon Maman preserves…will be making this crumb cake tomorrow morning. I love a good crumb cake but I’ve never seen one with cream cheese and jam. This looks delicious! Preserves and LeCreuset! Love it! I had no idea Le Creuset makes a cake stand! So cool, and so pretty! Oh, boy, does that look yummy! I made a KA coffeecake this weekend, but sent it to DH’s work, so didn’t get to taste it. This cake stand is Gorgeous!! I’m almost ashamed to say that I don’t own a cake stand. My cakes must sit, sadly, on too-small plates. Oh, my. This looks like a stomach ache waiting to happen…mostly because I don’t know how to stop eating delicious food. That crumb cake looks SO good! I want to make it for myself for Mother’s Day:). This looks SO delicious!! I use Bonne Maman all the time when I cook- it is also delicious! The cakestand is awesome but the cake looks even better! The crumb cake looks fabulous and Le Creuset…what can I say? I’ve had Le Creuset in my kitchen all of my life. My Mom had her beautiful set and then she bought me my own when I got married. I have built on it over time and LOVE it! Would love to have that cake stand. 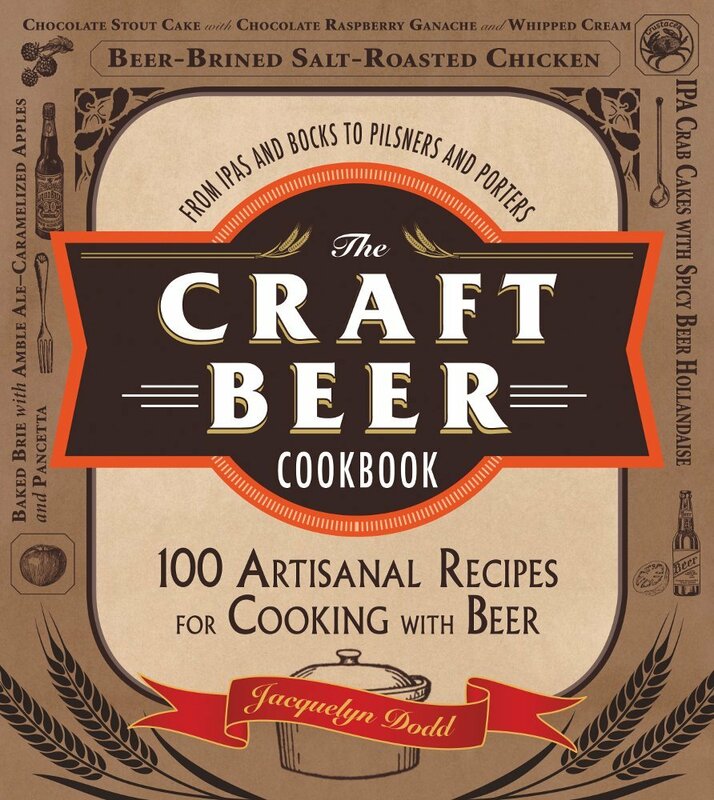 I’m so glad I ran across you on FoodGawker! Love the site, the recipes, and such a bonus that you’re doing this great give away! Yum, very quick to make and SO delicous! It is the best crumb cake I have ever eaten, Thanks so much! Love the recipe! and the cake stand too! Hmmm…… can’t wait to bake this cake….. Thanks for the giveaway! I love the red cake plate! Mmmm cream cheese anything has got my attention! That crumb cake looks delicious. I would love to serve a chocolate cake on this stand! Bonne Maman & Le Creuset is my dream of heaven on earth! Thanks for an awesome giveaway! Crumb is why I eat coffee cake! I didn’t know le creuset made cake pans. its gorgeous. A gorgeous stand for a gorgeous cake. Thanks! 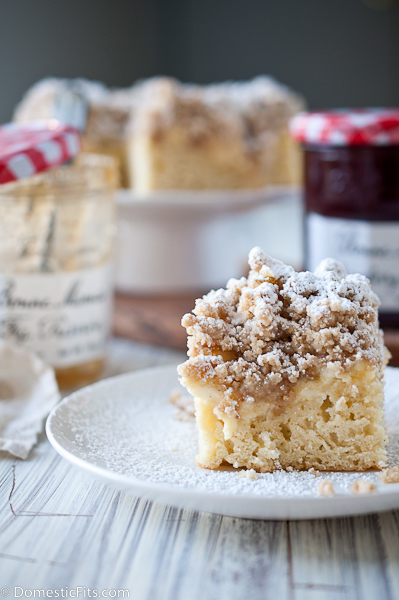 2 of my favorite things (jam and crumbs) make a great Coffeecake! Thanks for hosting the giveaway! dying to own a pretty cake stand! I am new to this website and I love the recipe. Thx for hosting the giveaway. Oh my goodness, that cake looks absolutely divine! Thank you also for the opportunity to win!!! This is a beautiful recipe. which flavor jam was used in the recipe on the picture? The strawberry. But any jam would work well.